Friday Night, Prudential Center. The Devils have just scored in OT to clinch a spot in the Stanley Cup Final. Sure, there were moments of sweetness and light as well, but it was the constant struggle that is so tiring and frustrating. The fact that nothing is accomplished easily. And yet … there was Friday night. You know, I’ve been to some pretty incredible sporting events … saw my favorite team win the Super Bowl. Saw my college football team win a national championship. But I don’t think I’ve ever enjoyed an in-person sporting event as much as last night because I got to share it with the entire family. It was simply magical. It’s true. At the start of this season, the Devils weren’t even among my favorite teams. How did I get here? How did I end up wearing an Ilya Kovalchuk jersey, taunting Henrik Lundqvist, jumping up and down with my entire family as we watched? 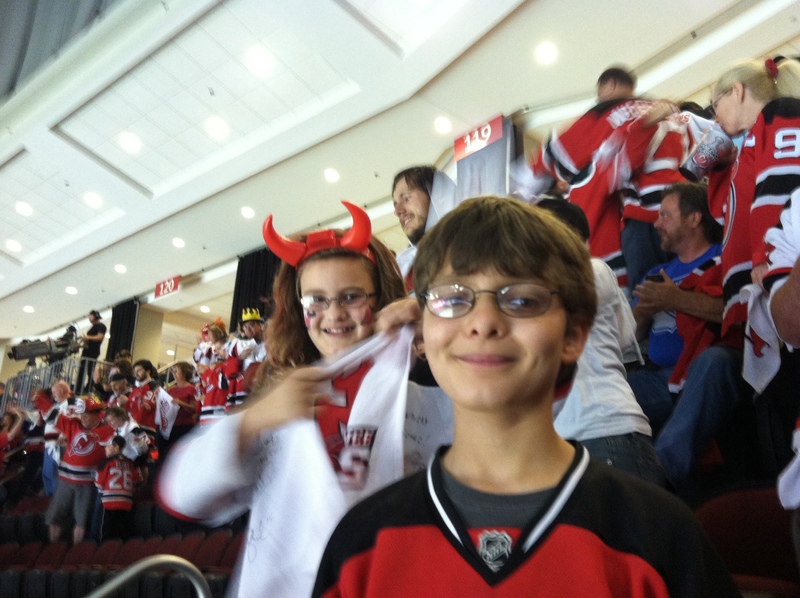 Sure I wanted the Devils to do well so my kids would be happy. But I wasn’t emotionally invested in the outcome. Perhaps it would have been different had they made the playoffs last year and we were able to attend as a family. Instead, I watched the clock run out on a season and hoped that Ryan would still care come fall. 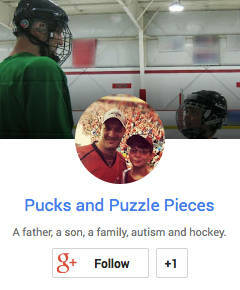 As I’ve written about many, many, many times on this blog, the reason we go to hockey games because it’s just about the only activity we can do as a family that everyone enjoys. Where we can be normal. Where we don’t have to negotiate constantly with Ryan. Friday started out rough and got worse as the day wore on. By the time I got home so we could all go to the game together, Veronica and the kids were barely speaking to each other. But all the angst faded as we made our way to the arena. The Devils were up three games to two in the series and had a chance to eliminate their biggest rivals, the New York Rangers, and make it to the Stanley Cup Final. To say all of this was unexpected would be an understatement. We followed our normal pregame routine, hanging out a bit on the outdoor plaza so Ryan could play street hockey and Riley could get her hair painted red. This time she added some face paint for good luck. We made our way inside and there was incredible energy in the building. I went to get food with Riley and returned to have Veronica explain how Ryan was taunting the Ranger fan sitting in front of us. Luckily, he was a good sport — very helpful when the Devils scored to make it 2-0 in the first period and Ryan calmly tapped him on the shoulder and asked “are you having fun yet?” I cringed, as I was too late to intervene. That the fan replied “no, not really” before turning back around proves that not all Rangers fans are bad people. With the Devils up two goals, I allowed myself to think ahead to the Stanley Cup Final, mostly about how the kids would always remember this spring and hopefully remember that we spent the time together as a family. Then the second period happened. The Rangers were dominant, scoring twice and taking complete control of the game. The third period was slightly more even, but the Rangers still held the territorial edge. Overtime loomed. Perhaps because the Devils had a one-game cushion in the series, Riley was stronger this time. There were no tears in the intermission before OT. Ryan announced to the entire men’s room “WHEN THE DEVILS SCORE THE NEXT GOAL, AND I DO MEAN WHEN, WE ARE STAYING FOR THE HANDSHAKES!” No matter, he still ended up getting me taunted for being the parent of a child who may have just jinxed his team’s best chance at the Final. Overtime began, and ended, in just over a minute. There was a chance at one end, then an innocent-looking play that turned into a crazy goal-mouth scramble at the other — the end right beneath us. We had a perfect view as the puck sat in the goal crease for what felt like a full minute before Adam Henrique poked it in, sending the crowd into ecstasy. We jumped up and down. We screamed for joy. I grabbed Riley and picked her up and gave her a huge hug and a kiss. I told her “YOU ARE GOING TO THE STANLEY CUP FINAL!!! !” in what felt like a scene copied from the Disney World Super Bowl MVP commercials. Ryan was having a blast, yelling at the top of his lungs. Riley was on cloud nine. Veronica, long since fully indoctrinated as a hockey fan, was ecstatic. Somewhat to my surprise, I was right there with them. Maybe it was just seeing the three people I care most about in the world all wrapped up in something and wanting to share it with them, but I felt incredible joy. I wanted the moment to last forever. For those 25-30 minutes, however long it took to get from Henrique’s goal back to our car, we didn’t have a single other care in the world. That’s a rarity for anyone. Rarer still when autism butts into our world whenever it damn well pleases. By Saturday morning, we were back to negotiating. But Friday night? There was only joy. I hope your efforts with the senate armed forces committee will be successful soon.